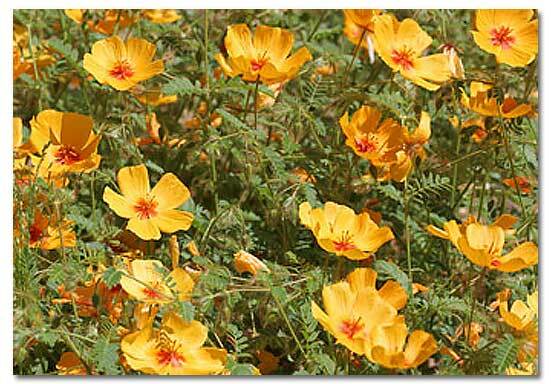 Common names such as "Arizona poppy," "summer poppy" and "orange caltrop" give some indication of this abundant annual plant’s lifestyle. Its orange flowers superficially resemble the orange flowers of the California poppy, and it blooms from July to October, often quite copiously in Arizona. One Spanish name, mal de ojos (sore eyes), comes about because the pollen may bother some people’s eyes. The generic name, Kallstroemia, honors an A. Kallstroem, an obscure contemporary of J. A. Scopoli, who coined the genus name in 1777. Grandiflora refers to the large flowers. Numerous branching, herbaceous stems arise from a stout, annual taproot, which can reach lengths of nine inches with lateral roots of eight inches. The deep root allows the plants to begin growing again if rains come after the normal growing season. Big plants in a wet roadside  Kallstroemia heaven  may reach heights of a yard and spread for several yards around the base. Hairs generally cover the leaves and stems with more pubescence in hotter and more alkaline conditions. Hairs can be white or yellowish. Elliptical leaves are one third to one-inch long and grow in pairs of 4 to 10 per stem. Abundant, five-petaled, three quarter to one and one-half-inch wide flowers rise above the plant. Generally bright orange with a red basal spot, they can also be white with a red basal spot or even yellowish with a dark orange spot. Petals have numerous nectar guides and are strongly ultraviolet reflective. Flowers only remain open for a single day, and they are cross-fertilizing for most of the day but become self-fertilizing as the flowers close. The Arizona poppy is common to profuse in flat, sandy grasslands from sea level to 6000 feet. A summer bloomer, Arizona poppies begin to appear with the rains and in particularly wet years, their display rivals spring wildflowers. Even if Kallstroemia dominates an area one year, it may be rare or nonexistent the next. Seeds remain viable for at least three years and germinate at irregular intervals. Although the flowers lack any fragrance, they are visited by at least 46 species, including bees, wasps, flies and butterflies. Insects find the flowers and get directions to pollen and nectar from the ultraviolet reflecting patterns of the flowers. Areas that are not reflective appear dark and indicate either the location of the nectar or act as guides that point to the sugar source. The great variety of visitors utilize the flowers in four distinct ways. Unlike many insect visitors to plants, three groups do not play a role in pollination. One group avoids the anthers and stigma by being too small. A second group, including honeybees and larger wasps, extract nectar from under the flower. A third clan only stops by for nectar. A fourth group gathers pollen and nectar from within the flower and contributes to both cross- and self-pollination. Researchers hypothesized that the non-pollinating visitors "contributed to the economy of the plant by reducing the quantity of available nectar so that the pollinators have to visit more flowers to get their full nectar supply." Throughout Sonoran and Chihuahuan deserts. South into Mexico but not Baja California. West to southern tip of California. Lieutenant William Hemsley Emory of the Corps of Topographical Engineers first obtained a specimen of Arizona poppy on October 28, 1846, near Safford, Arizona on the Gila River.